After squeezing all five of us into a 3/4 bath . . . . all the way downstairs . . .. for a whole year, I am pleased to announce that the upstairs bathroom is officially finished. We are now calling this bathroom the “master bathroom” in hopes of inspiring the offspring to continue using the downstairs bathroom. Our plan has only been mildly successful. In case you missed the previous post with the before pictures, let me enlighten you. The transformation has been dramatic, to say the least. Basically, it went from gas station restroom to turn of the century luxurious Italian hotel lavatory. This post may contain some affiliate links for your convenience. Click here to read my full disclosure policy. I give you the finished Master Bathroom. We kept the original door, for obvious reasons, while changing out the door knob and adding that charming cast iron “toilette” sign. I receive frequent inquiries concerning the functionality of the frosted window on our bathroom door and let me assure you, it provides plenty of privacy. 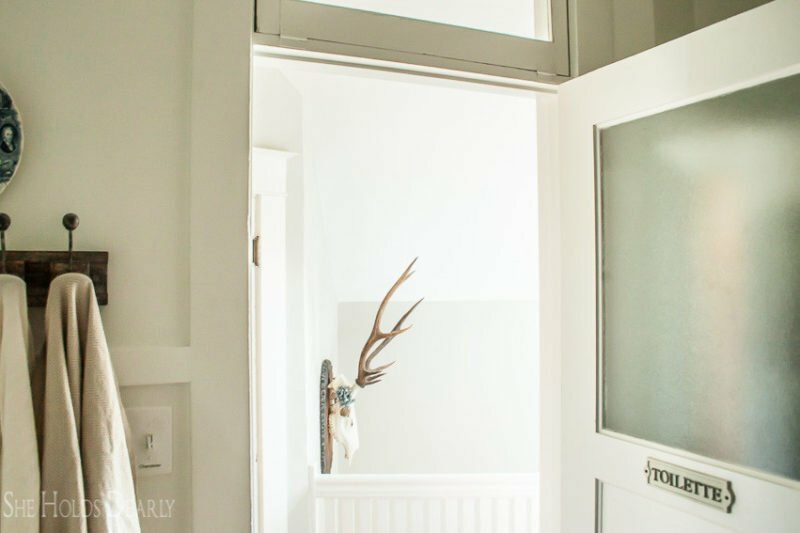 I highly recommend frosted windows in vintage doors. 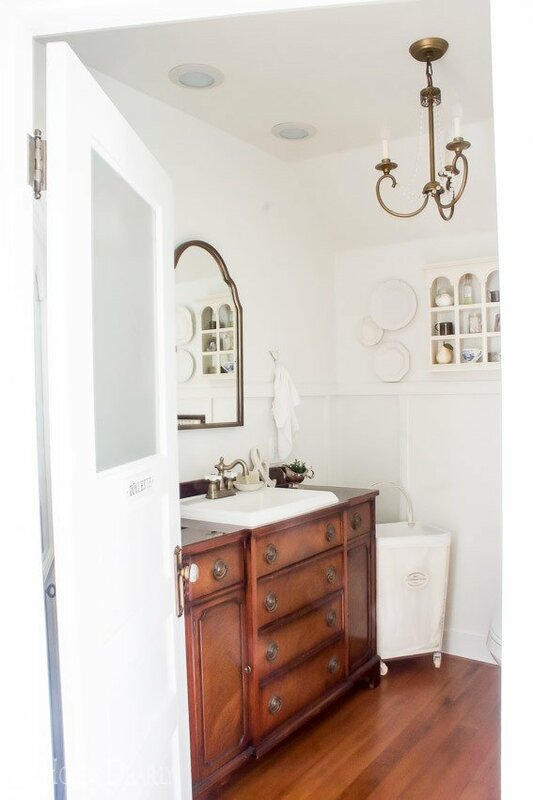 One of my favorite aspects of the bathroom door is the transom above it, this must have been how the original family ventilated the room in the early 1900’s. 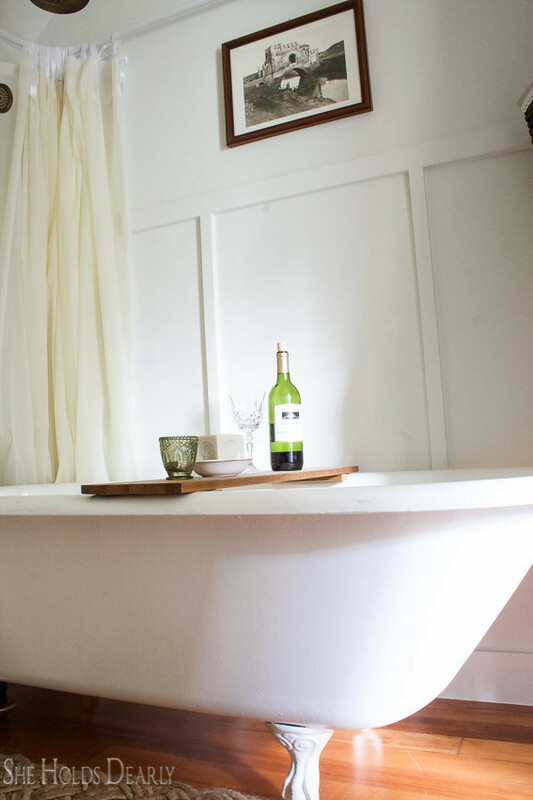 We were fortunate enough to be gifted a vintage claw foot tub by dear friends. After patching and refinishing this beauty with an epoxy acrylic product, she is as good as new. I cannot tell you how lovely a cast iron claw foot tub has been, it is definitely one of the highlights of this house. Finding an oval curtain rod in our price range proved to be a challenge. The tub had to be right up next to the wall, so the curtain and rod were crammed, as well. In the end my husband bent and soldered together copper pipes to make a custom curtain rod that hung from the ceiling. You can purchase a similar one here. I also had to make a custom shower curtain. I needed something very thin, but water proof. Half of the tub could only have a liner because of how the tub sits right up against the wall. But, the side next to the toilet needed something a little more layered and aesthetically pleasing. I ended up buying three shower curtain liners at the Dollar Tree and cutting/ sewing them the way I wanted them. 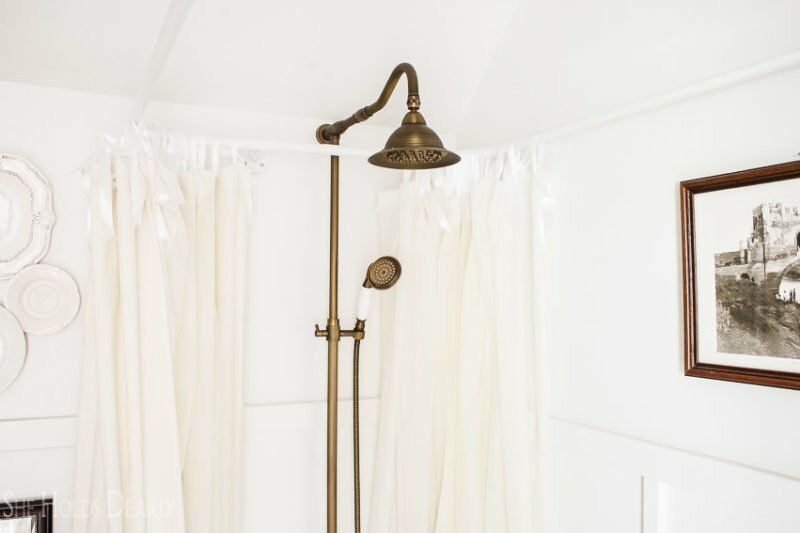 The “shower curtain” outside the tub is an old duvet from a rummage sale. All this was hung with satin ribbon instead of curtain rings. I tried several rings, but they just didn’t have that c. 1900s look I was going for. 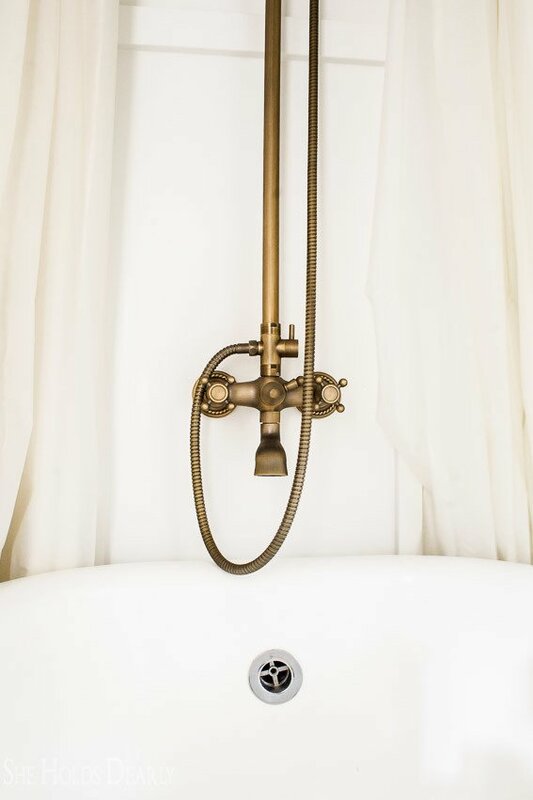 I had $1000 bohemian beauty of a shower head picked out and scoured Ebay for a knock off version. I found one for under $200 and was ecstatic. However, when it arrived we were a little alarmed- no instructions, missing parts, all labels written in Chinese and the box looked like it had been run over by a truck. Such is the life of a frugal decorator. My tenacious husband made several trips to Home Depot, got it all up and running and I am happy to report we have had no leaks to date. It doesn’t look like the shower head is still available, but here is a similar one, if you are brave enough to try this. I also found the sink faucet on Ebay. The arrival and installation were both less dramatic than the shower head. The chandelier is from Home Depot. The Estelle line by Hampton Bay has a six light chandelier and matching wall sconces, as well, if you are interested. 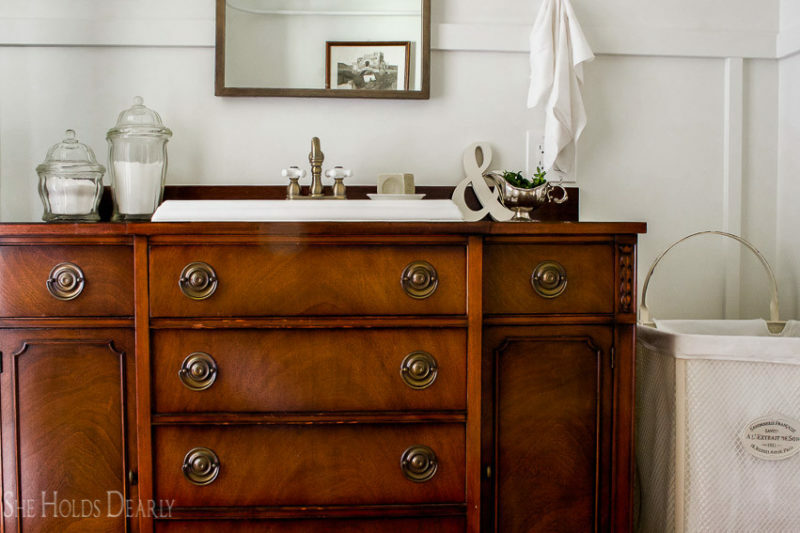 I adore vanities made from antique furniture almost as much as I adore freestanding tubs. I think I looked at over 3,000 dressers and buffets on Craigslist before finding this one. I wish that was an exaggeration. Eventually, I found a vintage buffet that was the right dimensions, in the right location, at the right price, etc. We had to make a matching backsplash and seal the top to make it water proof. Most of the drawers had to be cut short and rebuilt to make room for the plumbing underneath. To make up for the storage space we lost when we tore out the make shift cupboard in the demo, I brought in a beautiful, antique curio that my grandmother left me. I have had it since the first grade. The back is mirrored and I have always thought the light inside to be so beautiful. We gave it a couple coats of white paint and it sits in the corner behind the door, it seems happy to have a second chance at life. There is no place to keep soap or conditioner in this shower, so the basket hanging on the hooks holds those things. 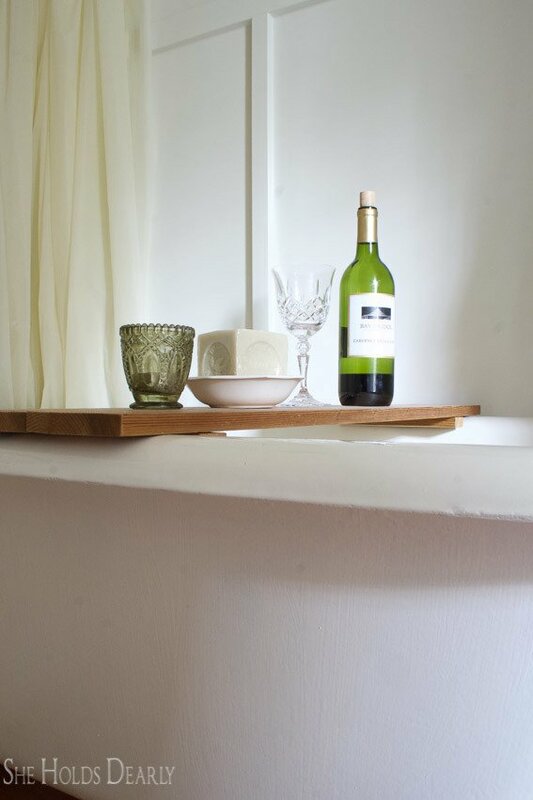 We made the simple butler tray and coated it with Miss Mustard Seed hemp oil for storage during bath time. 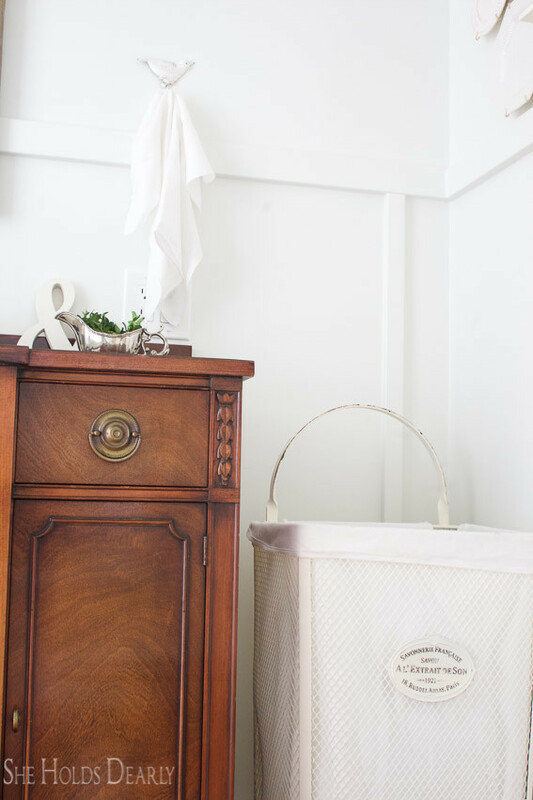 The hamper and wooden towel hooks are both from World Market. All art, dishes and storage containers are from yard sales. The mirror proved to be even more difficult to procure than the vanity. The first one my husband and I had a miscommunication on and it was hung incorrectly one evening. At 2AM that night, it came crashing down and scared the living daylights out of everyone! The second one was a Craigslist buy that I doubted at the time of purchase and should have walked away from. I resold it on Craigslist. The third one was discontinued, so I made it my life mission to contact every company I could find online that used to sell it. Surely, someone had one in their back room. Nope. Sixteen mirror orders later, I chose this one. And I still ended up painting it to the match the sink faucet. Good times. 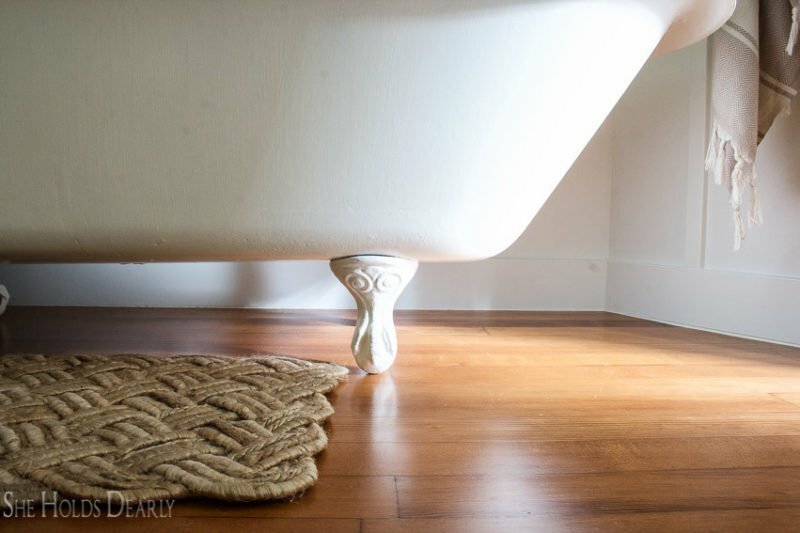 The woven bathmat is actually a door mat from JoAnns, it is discontinued, but any soft woven doormat would do. It is by far the best bath mat we have ever had! 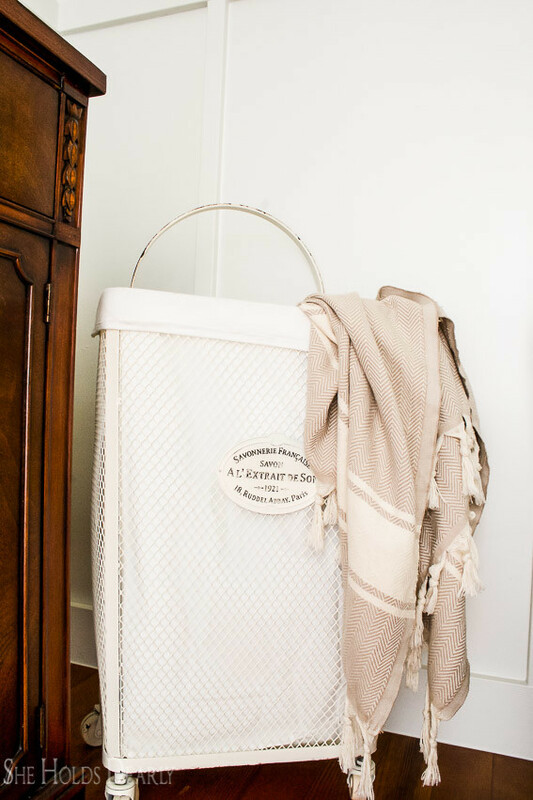 No more dirty white bathmats. 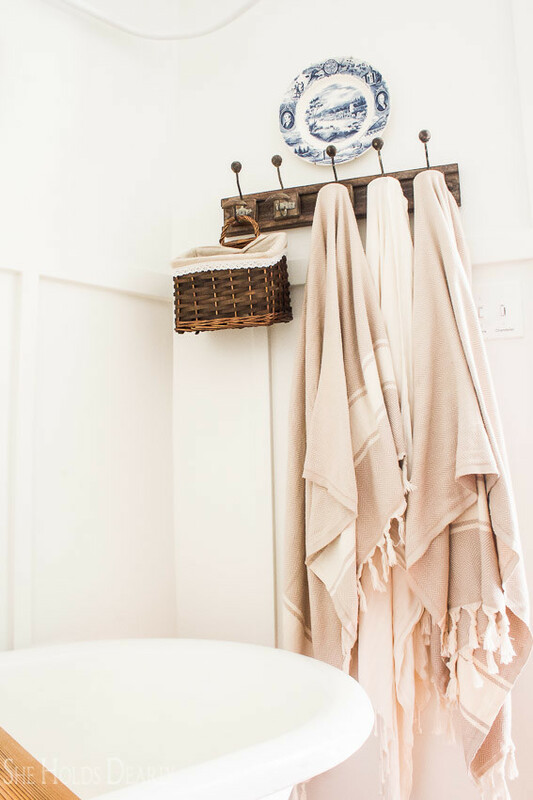 The turkish towels are from Etsy. 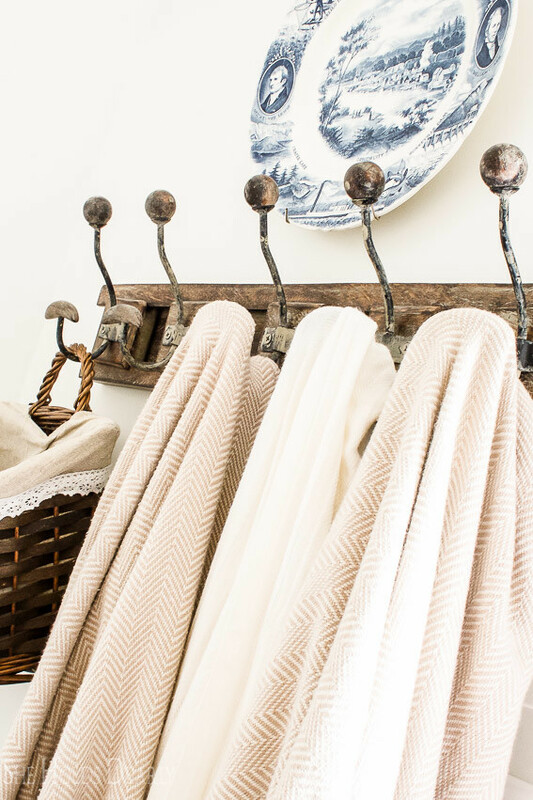 (These exact towels may be sold, but the seller has many similar ones to the towels I purchased.) They are really beautiful, but were very expensive and the jury is still out as to whether they absorb water very well. I’ve heard they get better after several washings. 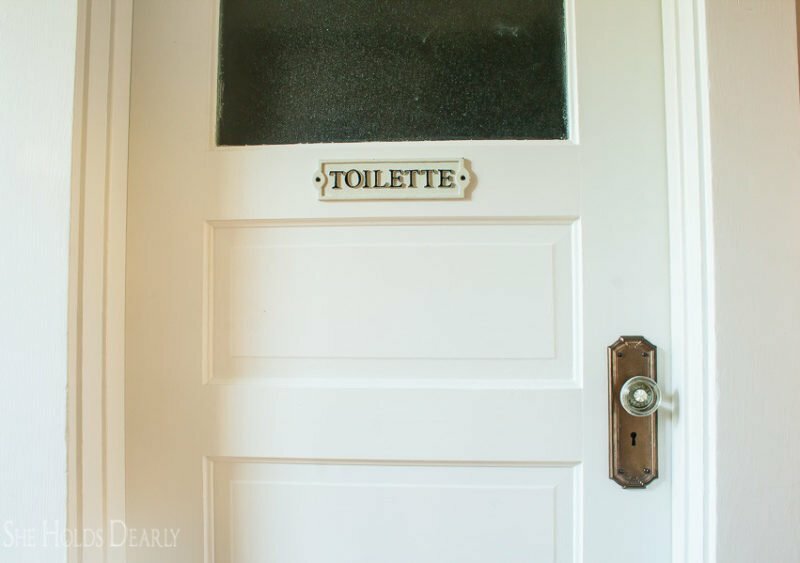 The darling “toilette” door sign was a birthday gift from a friend and can be found on Amazon for only a few dollars. It is cast iron and the most excellent quality. The door knob and plates are off Ebay. The glass knob was listed as very rare and unique. Sounded good to me, so I bought it. Then, I went next door to my neighbor’s house and she had the exact same knob on her pantry door! So, what does that mean? Are we both suckers or are we both just awesome? I have had several inquiries on Instagram about our paint color. It isn’t a “real” color, we just had Rodda paint take their white base paint and add a couple shots of black, hope that helps. Sarah, this is incredible! Well done, I love it all. And that bathtub is so dreamy. Sarah, thank you so much for your encouragement and kind words! They mean so much coming from someone as talented as you. Wendy, you are the sweetest! Thank you for stopping by. I love it all so much! The tub is amazing! Marcy, thank you for celebrating this huge accomplishment with us! You are such a sweetheart. Absolutely stunning my friend! I went to your etsy link for the towels and someone beat me to it! Sold! I need to learn to blog more like uou, loved the links and everything about it! Great job Sarah. You are so inspirational! Thank you, Morgan! I’m sorry about the towels, did you see any that were similar? Sarah! I can’t even! This is so stinking Gorgeous!!! 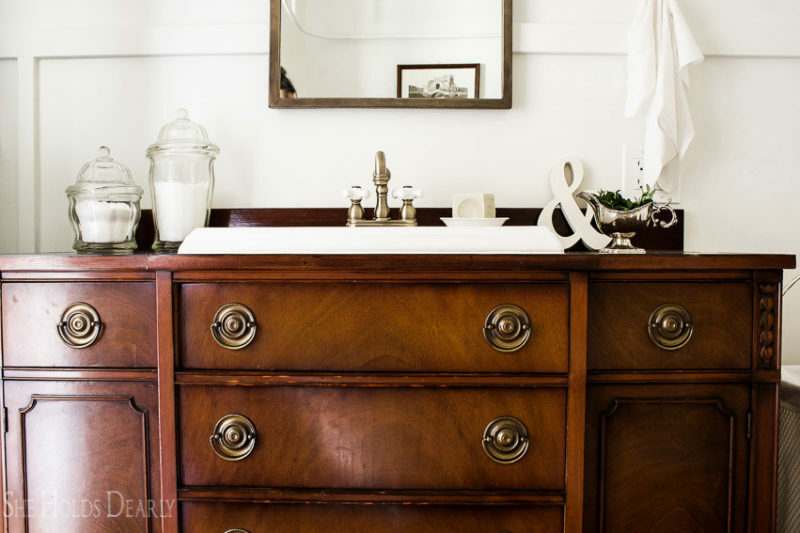 The vanity…LOVE! I’m sharing this everywhere! Oh, thank you, you are so gracious! I really appreciate you sharing this, as well. What an encouragement you are to me! I’m so thankful for a real life tour of this incredible room! You are a real inspiration, Sarah! 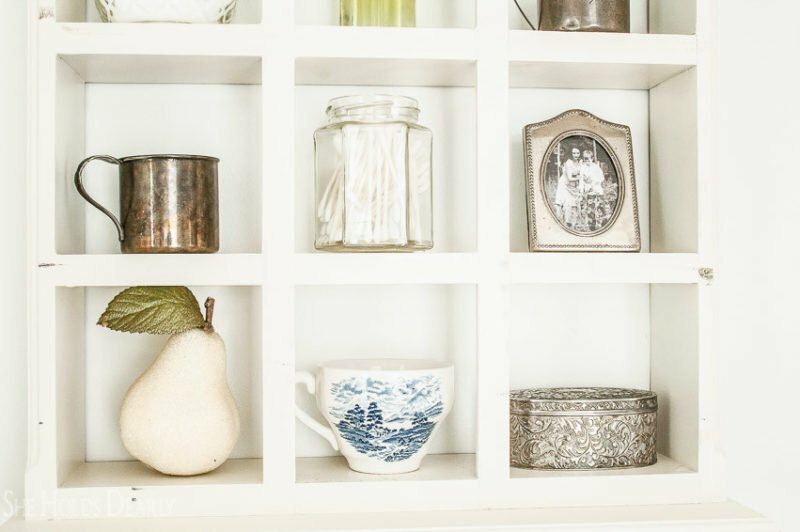 This space is completely charming in every way, just like you! I love what you and your husband have created together. Continue the amazing work! It was so wonderful to spend the day together, thank you for all your enthusiasm and design ideas. You are a dear! Gorgeous Sarah! 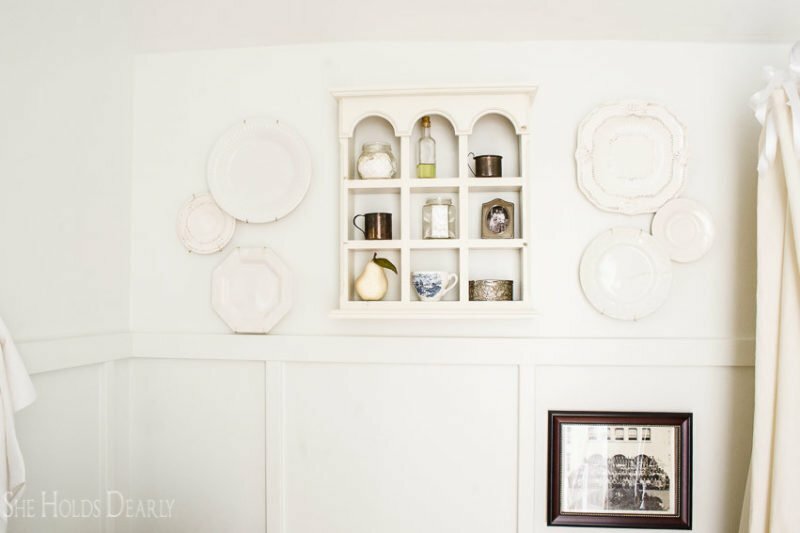 I’m a huge fan of repurposing antiques so I especially love the two pieces you used here. 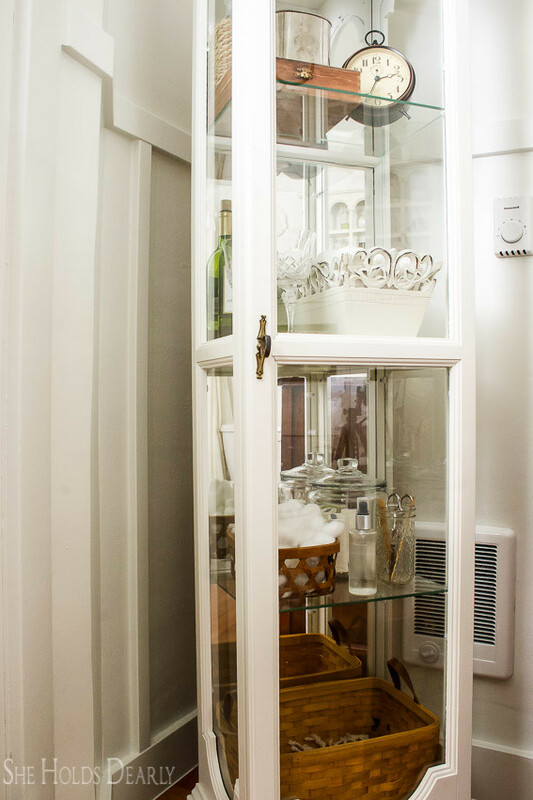 We’re searching for a similar cabinet for our master bath now. You’ve styled yours so beautifully and the light is an unexpected feature. Thank you for stopping by and leaving me such a sweet note! 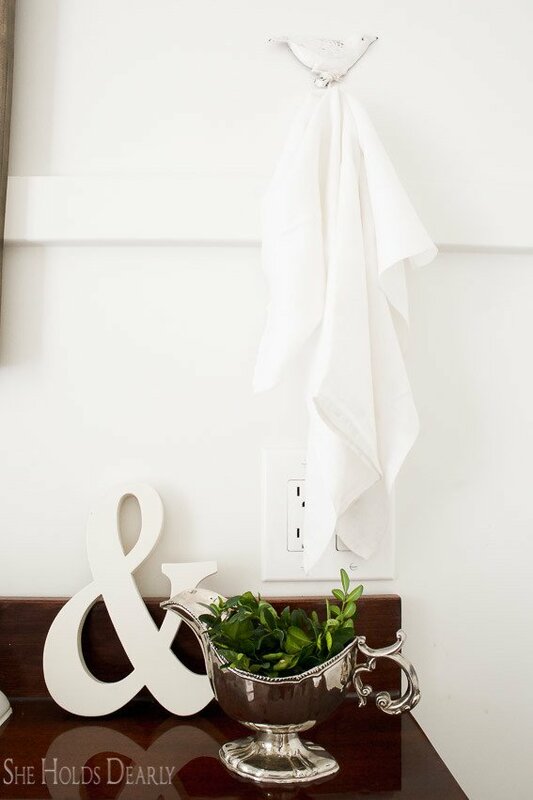 I just can’t wait to see what you come up with for your home. 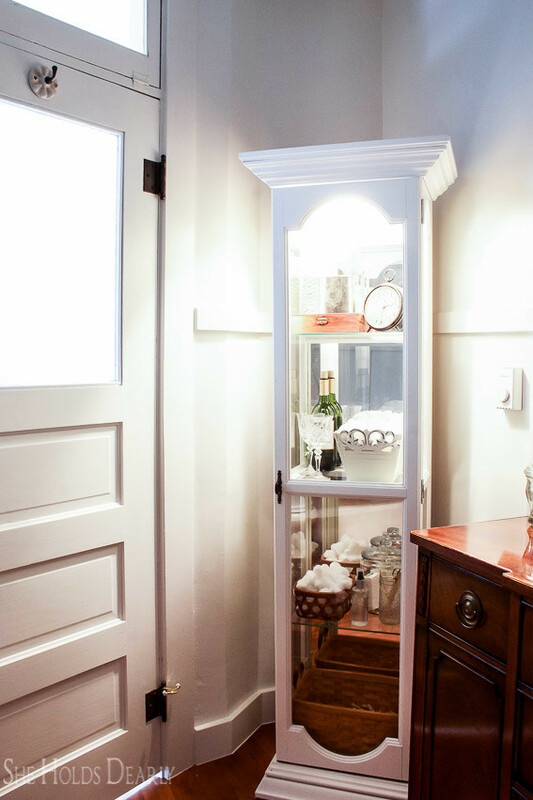 And, yes, I highly recommend a cabinet with a light for ambiance. I think you will love it! Sarah!!!!! What a fabulous transformation & very entertaining post. 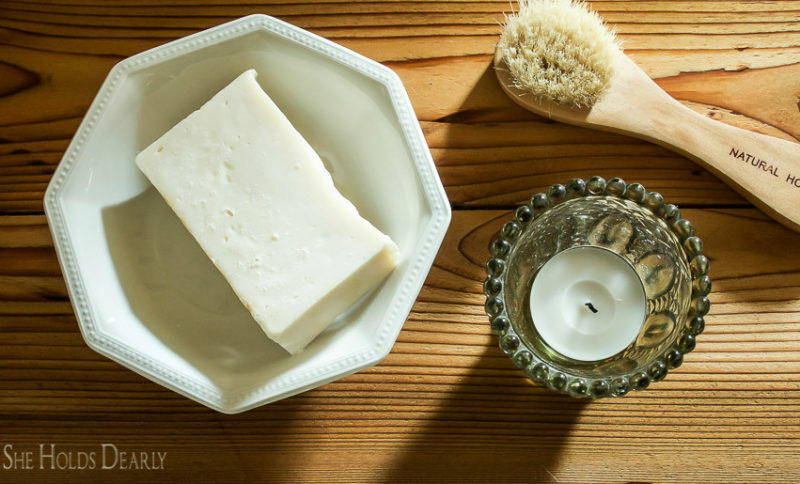 LOVE it all – so much I just created a new bathroom board & pinned . So glad I am getting your emails now! Yay! Good news, glad to know my emails are finally working for everyone. Haha, you are so sweet, I need to get over to Pinterest and check out your new board! Susan, the shower faucet is from Ebay and my husband custom made the shower curtain rod. Is that what you mean? There are a couple of links to similar products in the post. How are you liking the vanity? We are preparing to finish a bath. 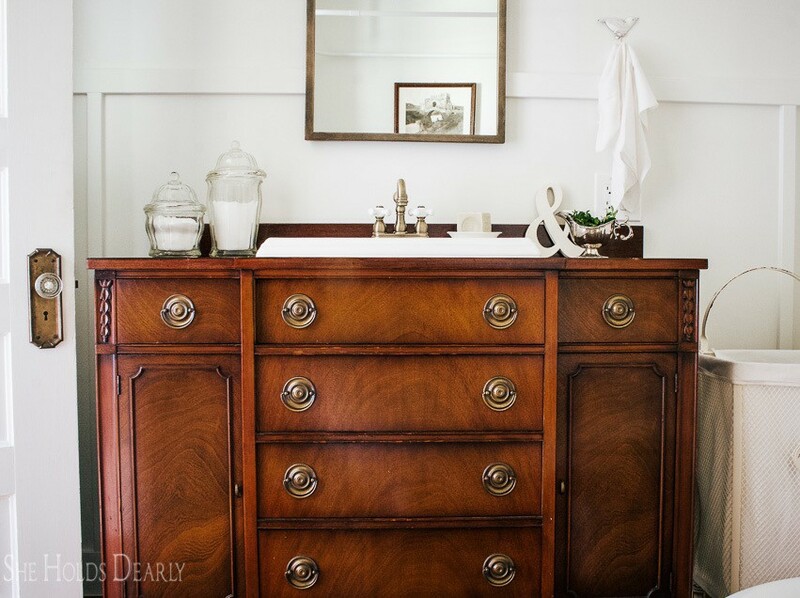 Hubs likes the antique furniture repurposed into a vanity, but I fear the wonky drawers will bother me. We would have room for a 72″ double bowl, but finding the right piece of furniture is definately trickier. Thanks for this inspiration. There’s much beauty here! You are right, the drawers are awkward sometimes. The fully functioning drawers are used normally and I keep items that aren’t used daily or even weekly in the odd drawers. Both our bathrooms have up cycled vintage furniture for vanities, so I have gotten very comfortable using open shelving for storage, as well. 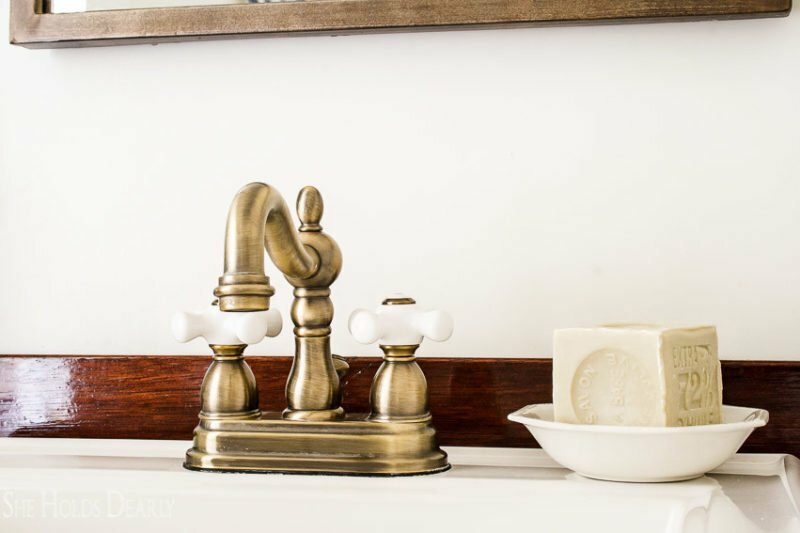 All your hard work paid off — your bathroom is gorgeous! Oh thank you, my dear! What a sweet thing to say. It’s gorgeous!! Such a transformation from what it was! What did you end up doing with the fabric for the shower curtain you got while you were here? Thank you, I am saving the Waverly fabric. I’m thinking maybe curtains in the hallway. I still love it, but it was too much pattern for that small of a room. What a gorgeous bathroom! It’s so elegant and homey at the same time. I could spend hours in there. It sounds like it took a ton of work to get it looking like this, but it was definitely worth it. Pinning just for all the inspiration! Rebecca, you are so sweet! Thank you for all your beautiful words, it was a ton of work but all the stress of it has faded and it is much fun to share the journey with people like you. Sarah!! 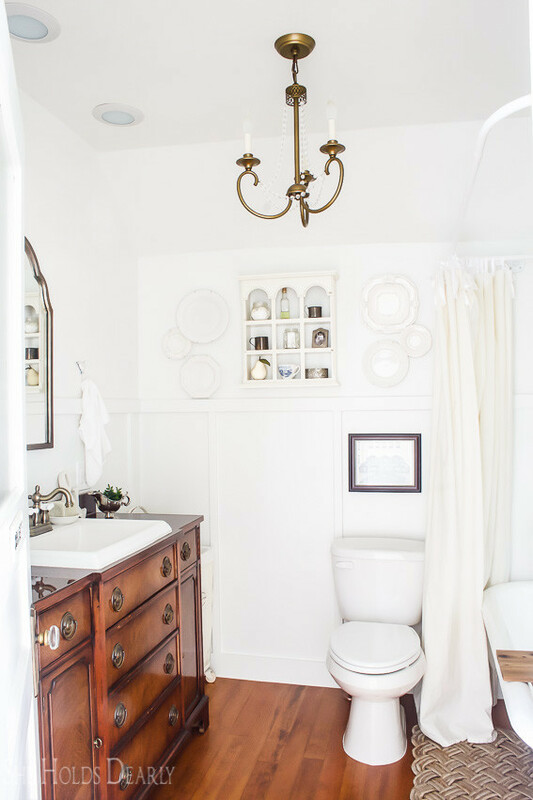 This is the most stunning bathroom to date! I am in love with every detail from the tub to the hardware finsih and the little sign on the door. You knocked it out of the park!! Thank you so much, Jessica! Wow, what a bunch of amazing compliments. You are always so encouraging to me. 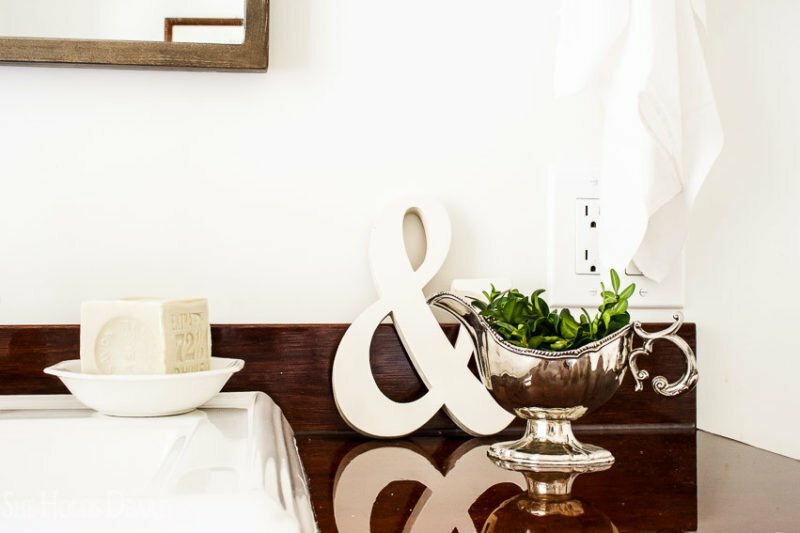 Everything about this makeover is so lovely! 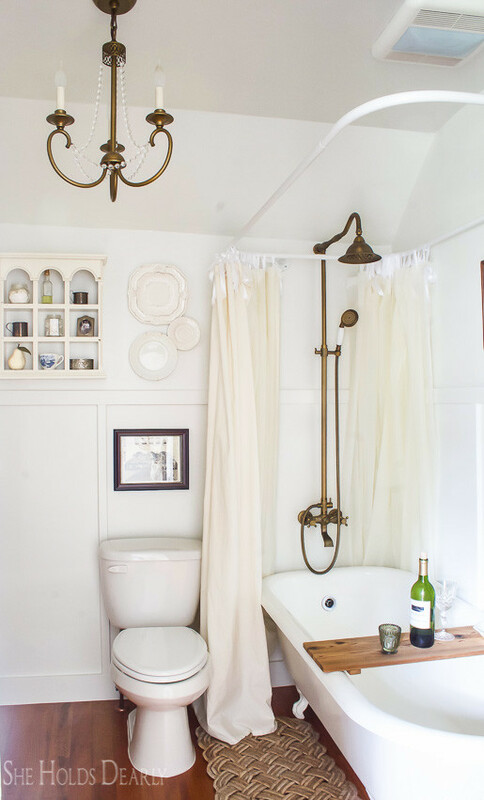 We have a 1940-50s style bathroom at the moment, but we would love to have a more historically appropriate bathroom in the future since our home is from the 1880s. We’re probably five years away from doing any major work in the bathroom, but I like to dream about it anyway.. This is precisely what we have in mind. Thanks for the inspiration! I will definitely be revisiting this post when the time comes. 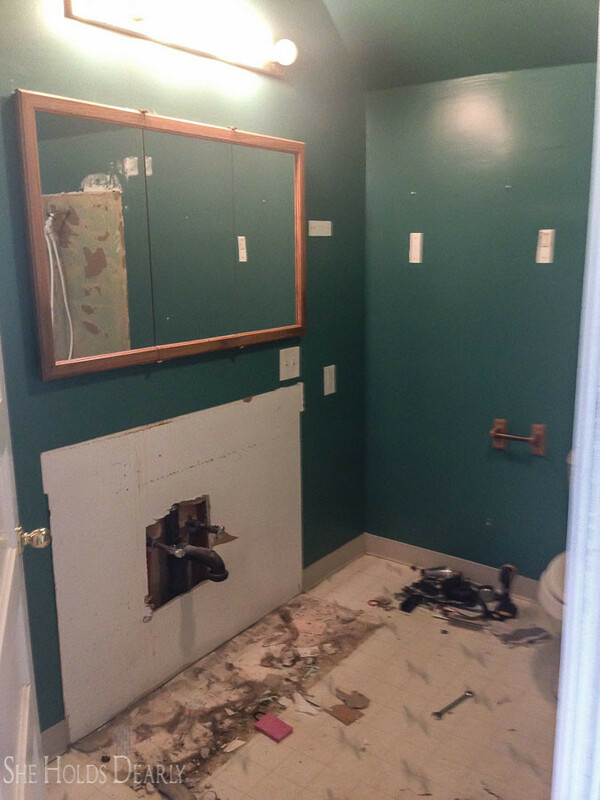 It took us about five years to get started on our remodel, too. You will know exactly what you want after that much time and it will truly be a masterpiece! I’m so glad to be an inspiration to you. 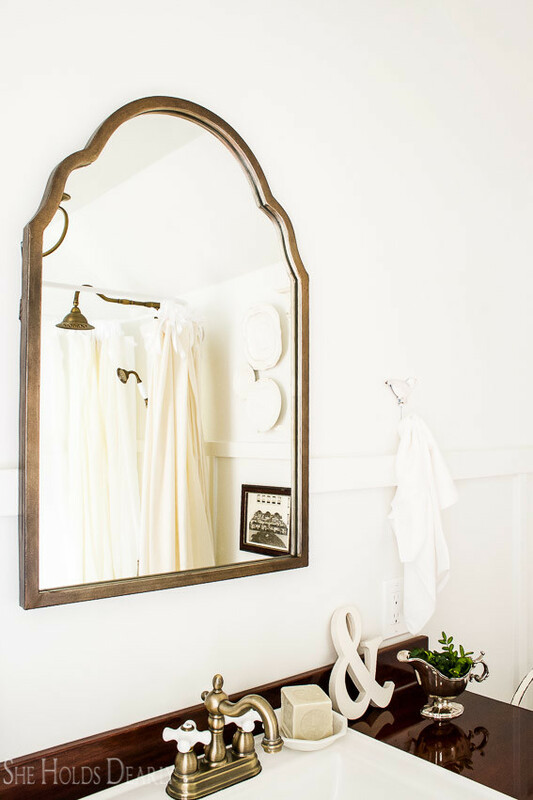 Sarah, your bathroom turned out just beautiful! I’m so impressed. You were definitely born with many gifts of talent! Oh, you are so sweet, Amy! I am so happy to be done with now. This old house is a double edged sword, for sure. So much work and so rewarding when we accomplish our restoration projects. I could look at these photos over and over and over! This is absolutely beautiful!! I love reading about the real-life challenges you had and how you resolved them. We all know that the process is far from perfect, but this room, Miss Sarah is worth all of it! I think you’ll enjoy it for years and years–its classic style will never tire. You are such an encouragement to me, thank you so very much, my dear! What a beautiful space you’ve created! Your choices are so serene and pretty. You have a gifted eye for detail! Love this bathroom! Enjoy! Have a wonderful day! Terry, you are always such an encouragement to me! Bless your heart! Thank you for all your kind words. Wow Sarah, I love love everything about your new master bathroom! It’s really stunning! Thank you for linking with Dream. Create. Inspire. Link! 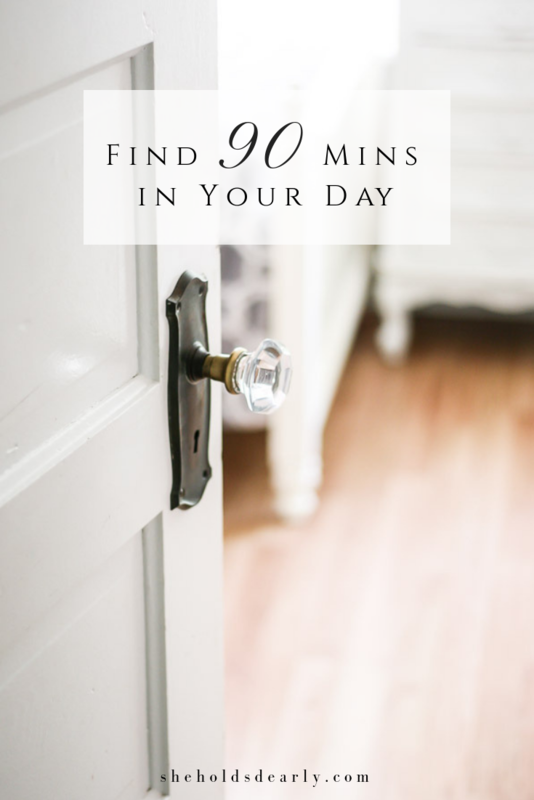 I’m pinning and sharing your post! You are the best, I really appreciate all your encouragement and enthusiasm. Thank you for promoting my post! Your home is dreamy! Who cares how long it takes. Savor the victories as they come! You are a talented decorator!! You sweet heart! Thank you for your kind words, they mean so much to me! 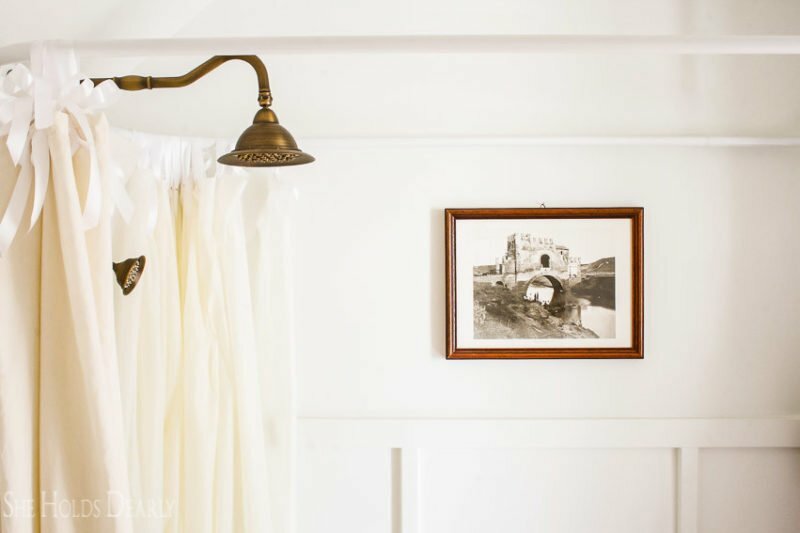 Sarah, your Master bath makeover is wonderful (discovered through MMS)! I have used the Rustoleum epoxy paint before on a tub, shower, tile counters (6 cans of product tells you how much I did!). I brushed on the product. It was a great improvement. I’m wondering whether you sprayed the product or used brush and/or roller? I am in a different place with a tub where the enamel has been worn off and want to redo the finish. I would rather use a sprayer to get a “finer” finish but am concerned about overspray with my tub not being removable. And, how are you liking the finish, so far? I used 2 different brands of epoxy finish last time and there was a BIG difference in product quality. What made you decide on the Rustoleum? I can’t remember, but I think that was the brand that I had the best result from (about 7+ years ago). We did indeed spray ours, with an HVLP sprayer. You could spray your tub as is, but the entire room should masked off. Don’t worry about the ceiling. Use 1 1/2 inch tape and .31 mil painters plastic (9 feet tall) and secure the plastic up at the top of the wall, and let the plastic hang down over everything. Rustoleum was the brand our paint store recommended so we went with that. It is very important to sand down your tub thoroughly before spraying. Wow Sarah, what a stunning bathroom transformation. I love the vintage feel with all the modern conveniences. And it feels so luxurious! Featured at Be Inspired this morning. Thanks so much for joining the party! 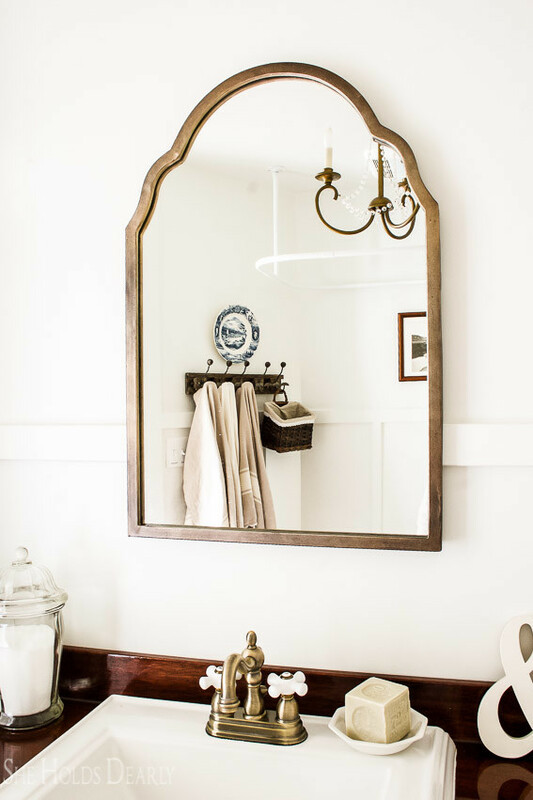 Your bathroom make over is absolutely gorgeous! It’s absolutely gorgeous! I love the character you’ve put into it. I love it! Thanks for linking up to The Handmade Hangout! I’ll be featuring you on my blog (www.occasionallycrafty.com) today when the new linky goes live at 6pm ET. I hope you’ll stop by and link up again! This is perfect in every way. I could sit in that bath all day and just admire the beauty! All of your hard work truly paid off in groves. Great job! Thank you for sharing this with us at The DIY Collective~I am so glad you did! This bathroom is gorgeous!! So luxurious. I love the bathtub. All the details that went into this room add that wow factor. You did an amazing job on this! I would like to invite you to link up to our party, Sweet Inspiration. It starts today and runs until Tuesday. Hope to see you there. Wow, this looks so beautiful! 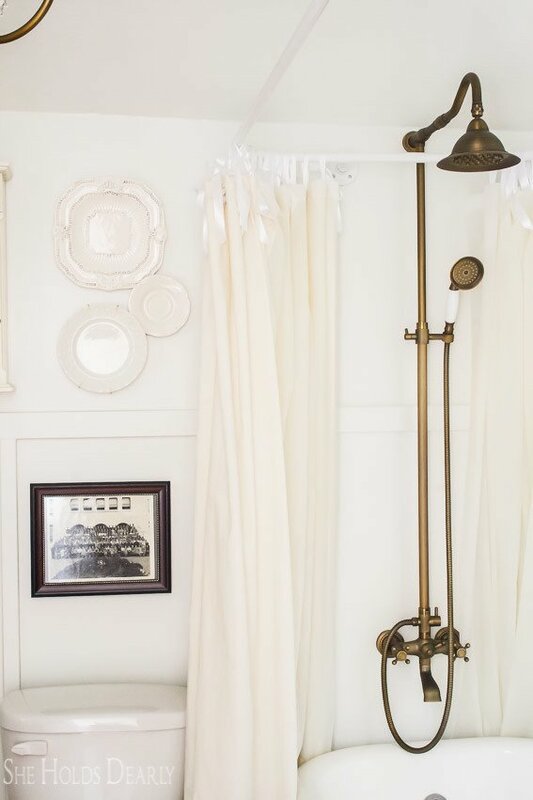 I love that tub and shower nozzle the best and the vanity is my second favorite! You certainly did a wonderful job in your bathroom. 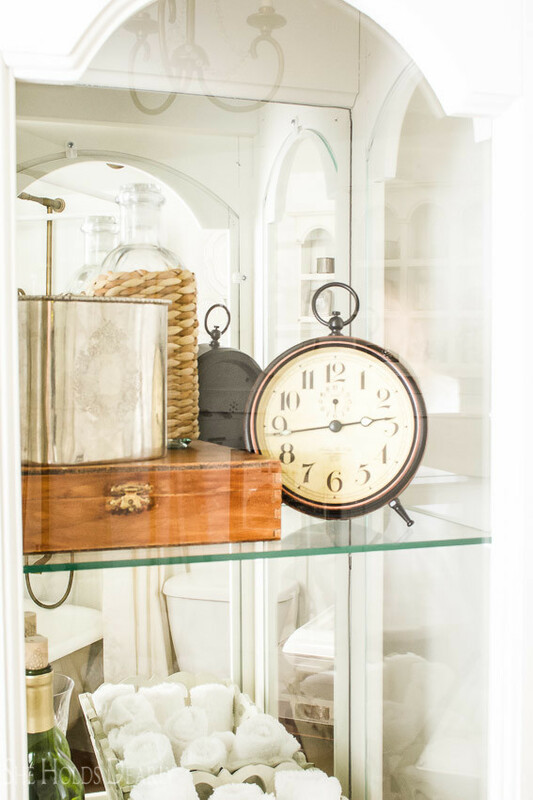 Love the vanity, faucet, shower head, shower-tub curtain surround that you created and lighted curio cabinet. Oh thank you, my dear! We are thoroughly enjoying that room now. If they gave emmy awards for room reveals? You’d win first place. That is by far the most stunning bathroom I have ever seen. You did a wonderful job! Oh my goodness! You are the sweetest! Thank you so much for all your compliments, I am honored. Oh my word, this is absolutely amazing. 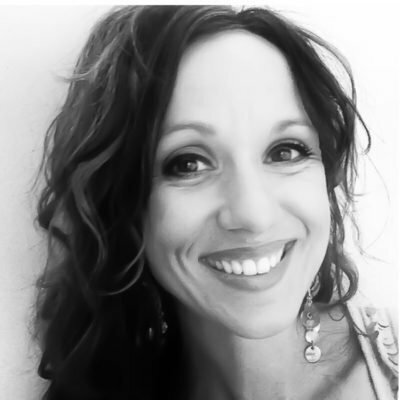 I can’t wait to feature you next week on Inspire Me Tuesday. Wow! Wow! Wow! Your bathroom is beautiful. That shower head is to die for! worth all of the trouble???? and the shower curtain! how beautiful and ingenious. After looking at 3000 buffets and dressers you totally knocked it out of the park with your selection. It’s gorgeous. Love it all, you really did an amazing job. You are the sweetest! Thank you so much for your showering of compliments! You have such a gift for words. Absolutely stunning! You put a lot of work into this and it came out looking so good! Your master bath turned out awesome.. Congrats on your award!!! Thank you, Pamela. It is so nice to finally have a beautiful bathroom! Just beautiful! A shaving brush would look nice in your blue and white cup. Oh Lorraine, you are a girl after my own heart! I love this idea. This master bath is absolutely gorgeous! 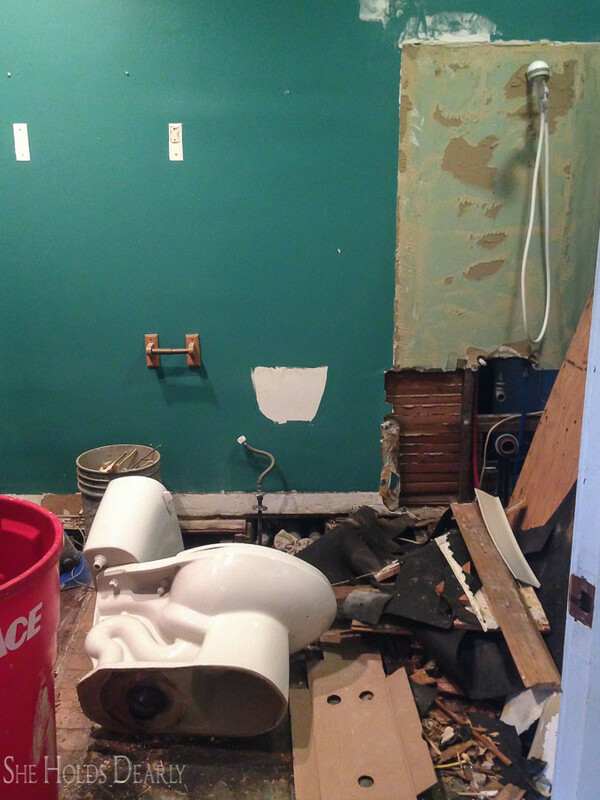 I know too well the many trials of renovating an old home. The best part comes when you lay your head on your pillow at night and at peace to dream of what you have accomplished, then awaken the next morning to find it all true. Just beautiful Sarah-I definitely pinned it. Thank you, dear, that means a lot to me and I know exactly what you mean! Beautiful! I bought the same shower head a few months ago but have not put it in yet. I had the same issue when I opened the box! What did your husband need to do/buy to make it work? 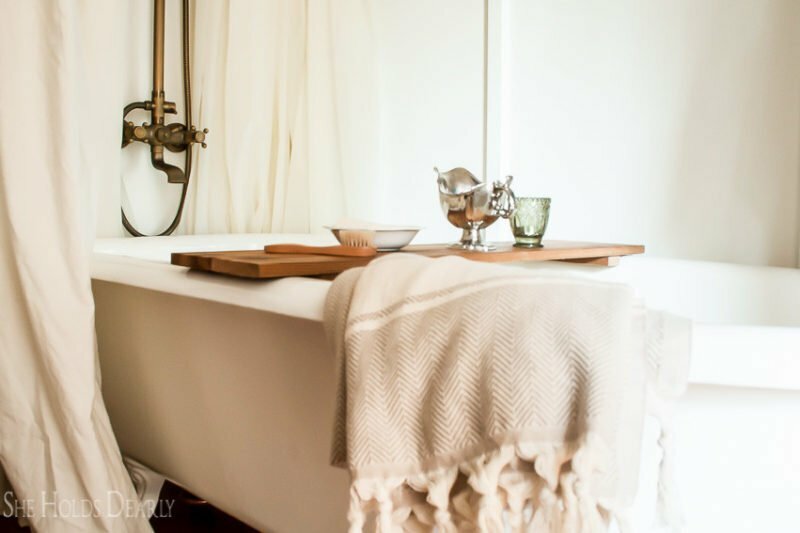 beautiful bathroom and very inspiring! You are definitely an inspiration for me while I try to style my own home. Thanks for sharing. Wow! I am impressed by how much work went in to this bathroom and the attention to detail and texture. Love it! I love it. It’s gorgeous. The details and the savings are amazing. 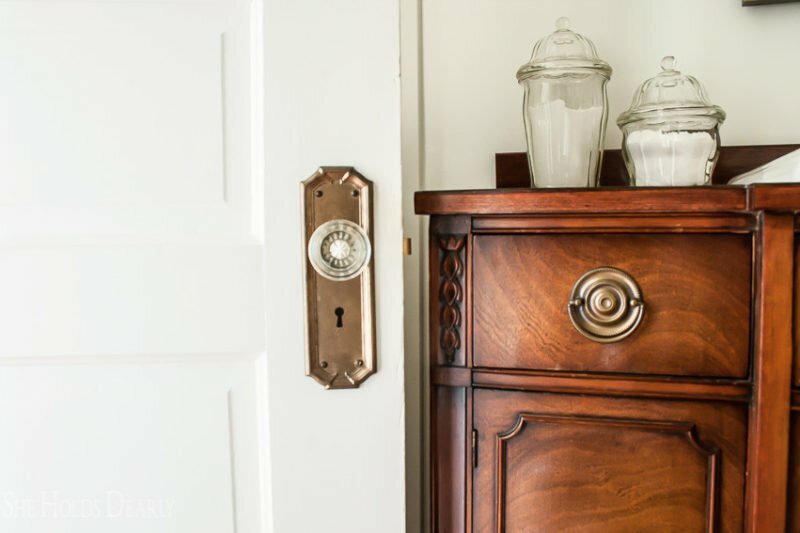 I love the door knob. Thank you so much, I’m glad you enjoyed it!